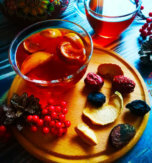 Slavic people like fresh and dried fruit drinks which can be served hot, warm or cold. There are a million ways to make fruit kompot. 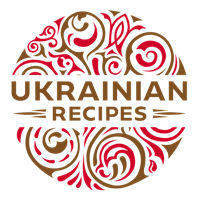 If you ask a Ukrainian what goes into his or her recipe, the answer might differ by region, season or family. Whether made from fresh fruits, dried fruits or their combination, what all these drinks do have in common is that they are amazingly flavorful and refreshing. Today I will share one of the possible recipes of this amazing drink. 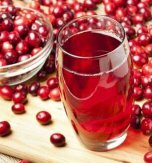 This drink is very tasty and has wonderful health benefits. We are going to combine fresh lemon, orange, apples, prunes and cranberry with dried fig and dried apricot. We will also add a cinnamon stick to impart some special zest to our drink. Peel an orange and a lemon. Squeeze 2-3 tbsp of lemon juice. Wash and peel apples. Remove the cores. Pour lemon juice in a pan. Add the orange and lemon rind, dried apricots and dried figs, apples, prunes, cinnamon stick, and 700 ml of water. Bring the mass to boil, add sugar and stir the drink until the sugar melts. Continue to cook under low heat. 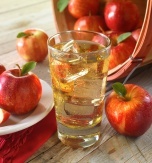 Cover the pan with a lid and boil the drink for 20 minutes (until the apples become soft). Then cool the drink. Place it in a fridge for 4 hours before serving. 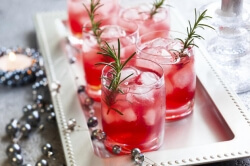 Add some ice cubes and rosemary twigs to the glasses with the drink before serving. That will give them more festive look. 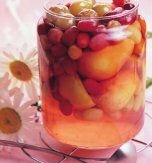 Do you have a favorite recipe of a fruit drink? If so, please let us know in the comments below or write us an e-mail.